“A century ago the Mormon Church was widely viewed as a morally and politically dangerous sect. In 1997, the celebration of the 150th anniversary that marked the beginning of the first Mormon emigration to the old West of the United States was observed. Mormons can be justifiably proud of this enormous effort, for it is truly one of the great emigrations of American history that was marked by great sacrifice, courage and visionary zeal. Throughout that year, the Mormon Church held many observances and reenactments that brought to life this well-known historical event. However, there are other incidents and occurances concerning the history of the Mormon Church which it will never bring to light and publicize, and for very good reason. For the church, the squelching of any discussion of these events is vital to maintaining the momentum of its enormously successful campaign to gain mainstream status in American culture. Behind the carefully crafted legend the church projects of its past, there exists a secret history of Mormonism which church-financed public relations blitzes will never allude to. The Mormon Church has continually relied upon its ability to conceal, deny, dismiss and rewrite major portions of it's own history, in an effort to deceptively sanitize its past - and to maintain its public image. we would like to bring to light some of this secret history so as to give you a more objective view of the claims of the Mormon Church that it makes about its own past. Joseph Smith, founder of the Mormon Church, claimed that in the spring of 1820, when he was a fourteen year old boy in upstate New York, he was visited by God and Christ and informed of the apostasy of all Christian churches. The visitation supposedly occurred in response to his attempt to make sense of a local revival then taking place among various denominations. This incident, called the First Vision, is what Mormon apostle Hugh Brown says "constitutes the groundwork of the Church which was later organized." Smith also claimed that his relation of the vision to his community brought great persecution upon him, further proving how spiritually ignorant and in need of restoration they were. As the Mormon Church began to develop, it was not long until the controversial practice of plural marriages or polygamy was adopted, around 1835. And the relationship between the practice of polygamy and Mormonism is far more extensive than the Latter Day Saint Church will ever admit, at least in this present day. For example, note this official statement by the church on its Internet web site: "Some early leaders and members of the Church entered into plural marriages during the latter half of the nineteenth century. After receiving a revelation, Church President Wilford Woodruff declared that the practice should be discontinued. That position has been reaffirmed by every President of the Church since." The "Historical Summary" contained in a new book published by the church on the teachings of Brigham Young, another early church leader, portrays his marital life as that of a happily remarried widower, saying nothing about his own deep involvement with polygamy. The church's position seems to be attempting to downplaying the extent of the practice among its early followers, even suggesting that these were isolated instances of aberration clearly out of the Mormon mainstream of the day in the 1800's. The truth is often much stranger than fiction, and this is particularly true in regards to polygamy among the Mormon Church of the nineteenth century. As the Church steadfastly avoids acknowledging just how extensive it was, it also deliberately ignores the fact that it was none other than Joseph Smith who first adopted the practice. At first he secretly practiced it alone, then with other leaders even while it was opposed by both church members and non-Mormons - and his wife Emma. When he could no longer keep the matter in secrecy, Smith then announced that he had received a revelation from God commanding that plural marriage be kept by all true believing Mormon men, since it was necessary to achieve godhood. This marital process - called "exaltation" - required them to have at least a second wife. This was a matter of public social and religious practice among Mormon culture in the Old West for well over 50 years. 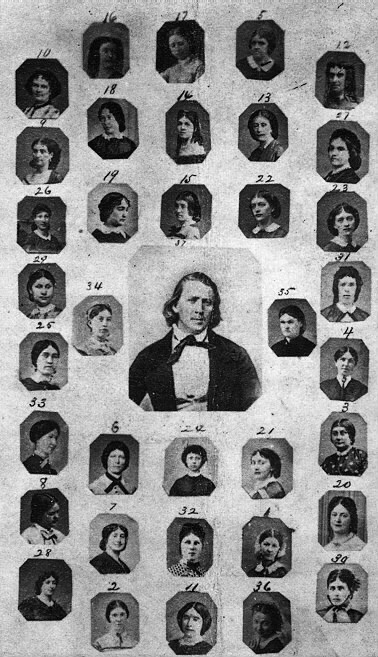 Brigham Young did not have only two wives as the book we just mentioned claims - he actually had upwards of twenty seven of them. Only Congress' refusal to grant statehood to the Utah territories until it was abandoned finally forced the Mormon prophet to publicly repudiate it through "revelation." With great reluctance the practice was finally given up only officially in the 1890s: those couples who had already been involved with it continued to generally cohabit and live as they used to, in full disobedience to the laws of the land. In 1844, just 14 years after publishing the Book of Mormon and organizing the Mormon Church, Joseph Smith was shot to death while a prisoner in the city jail of Carthage, Illinois when a band of armed men stormed the building. In another standard work of the Church, the Doctrine and Covenants, Smith was said to be as a "lamb led to the slaughter" as he traveled to Carthage to give himself up to the authorities as one who would die innocently and in cold blood. Church history has always taken great pains to portray Smith as a martyr: this is readily apparent when a visitor to Temple Square in the heart of Salt Lake City, Utah is invited to view "Legacy" a motion picture shown at the Joseph Smith Memorial Building. It powerfully portrays Smith's death as that of a passive victim of mob violence, a defenseless figure suffering for preaching the Mormon restoration of Christianity. Millions of visitors annually are confronted with this story, as well as at annual memorials at the preserved jail in Carthage. Again, the actual historical truth is considerably different. Smith did not, as is dramatically portrayed, quietly resign to die without a struggle. A portion of the official History of the Church which is never quoted reveals that Smith pulled a six-shooter pistol and returned the fire of the mob as it broke down his cell door. John Taylor, who would later become the third prophet of the church, recounted in another portion of this History that Smith shot and killed two men who were attempting to storm his jail cell and wounded another before he was shot as he attempted to escape the room through the second story window of the jail, and was killed by gunfire in the street. This is another portion of the secret history of Mormonism that most Mormons, let alone non-Mormons are not even aware of. Smith did not die as a martyr whatsoever - he died defending himself and tried to escape, which under the circumstances is understandable, but hardly qualifies him as a "lamb led to the slaughter." The last portion of the secret history of Mormonism we will briefly examine is the role of the church in what is now known as the Mountain Meadows Massacre. In September 1857, after a prolonged siege, a wagon train of settlers emigrating to California was virtually wiped off the face of the earth by an armed band of men as they passed through the territories of Southern Utah. While the church says absolutely nothing about it, and allows secular history to recall the tragedy, what little it has said has made it clear that it views the attack as one in which Indian hostilities played a prominent role in the disaster. An article in a church magazine reporting on the erection of a memorial to the incident appeared to be carefully worded so that an ignorant reader would get the idea that Indians did the killing, and would get no clue about what really happened. Again the truth must be made known. The massacre was a deliberate act of Mormon militia acting under orders from church officials doubling as local military leaders who were assisted by their Indian allies. Mormon militia disguised themselves as Indians during the abortive siege of the wagon train. And it was under a flag of truce that the emigrants were mercilessly slaughtered - after laying down their own weapons and after having been convinced that the Mormon militiamen were there to actually help them. The estimated number of victims ranged from 100 to 150; the exact number may never be known. Sermons by Brigham Young and other church leaders, before the wagon train entered the southern Utah territories had advocated the immediate execution of all of those who the Mormons considered their enemies whenever possible. It seems certain that this helped to create a social and religious antagonism that made it possible, even admirable, to be involved in the cold-blooded murders of men, women and children. The tragic losses of life at Jonestown, Waco and Rancho Santa Fe pale in comparison to these horrific crimes done in the name of God. These are just some of the highlights of the secret history of Mormonism that you won't ever hear mentioned by the Mormon Church. Time will not allow us to discuss any other of the questionable historical whitewashings that the Church has made. In our opinion, it raises the gravest questions regarding the credibility of the claims of a church asserting itself to be the only "true church." Think about it. How can you seriously entertain the claims of a religious organization that has exerted all of the effort it has made to conceal it's less than divine origins and history? Despite all of the problems one may find with contemporary Christian denominations today, they pale to insignificance when compared to the duplicity, deception and distortion that the Mormon Church has engaged to create the pristine image it now wields. If the Mormon Church can be said to be true in any way at all, then an excellent place for it to demonstrate its truthful nature is in an honest admission and assessment of its historical deceptions. However, over 150 years of history have proven that this is highly unlikely. As we close, we urge you to do your own homework and learn more about the Church than it will tell you about itself - and to not forget one important point: if you get involved with an organized religion without knowing its history, a stranger will be claiming your faith.